One pot uber-fudgie brownies. No mixer required. It’s a brownie baking kinda night. 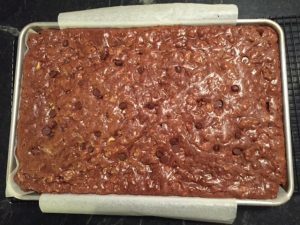 I typically double (in a 15 x10 inch pan or 13×9) or triple the recipe and put them in a half-sheet pan (18×13) because these brownies are meant to be given away. 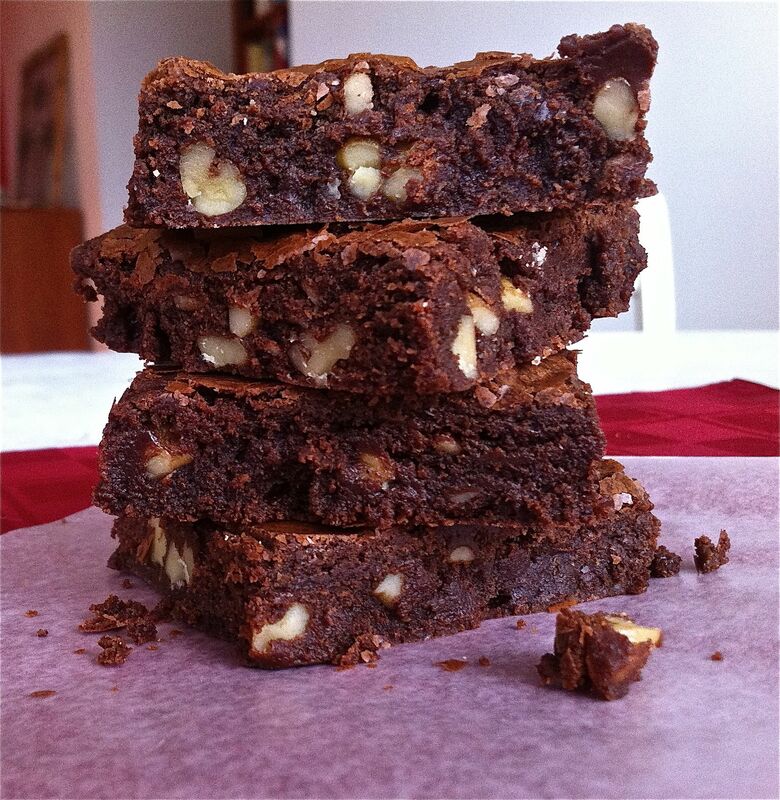 They’re loaded with walnuts and well, chocolate. Don’t like nuts? Leave ’em out. But, remember, walnuts are high in good-for-you fats that provide protection against a host of health problems. And dark chocolate, including bittersweet, has heart-healthy antioxidants and has been found to lower blood pressure. Never mind the butter and sugar. Surely the nuts and chocolate cancel out the butter-sugar concerns. I like to think these brownies are a health food. Double batch of walnut-loaded fudge brownies baked in a jelly roll pan. 1. Preheat oven to 350°F. Grease an 8x8x2-inch or 9x9x2-inch baking pan; set aside. 2. In a medium saucepan, combine butter and bittersweet chocolate. Cook and stir over medium heat until butter and chocolate are melted. Remove from heat. Using a wooden spoon, stir granulated sugar and brown sugar into chocolate mixture until smooth. Add eggs, beating with spoon until well combined. 3. In a small bowl, combine flour and baking powder. Stir flour mixture into the chocolate mixture just until combined. Stir in nuts and milk chocolate pieces (batter will be thick). Spread in prepared pan. Bake for 25 minutes or until top is set but still soft. (A toothpick inserted in center will come out slightly gooey.) Cool on a wire rack. Cut into bars. Makes 16 brownies. parchment, leaving an overhang on two opposite sides. Butter the foil. When brownies are baked and cooled, lift out the foil along with the slab of brownies. Remove foil and cut brownies. 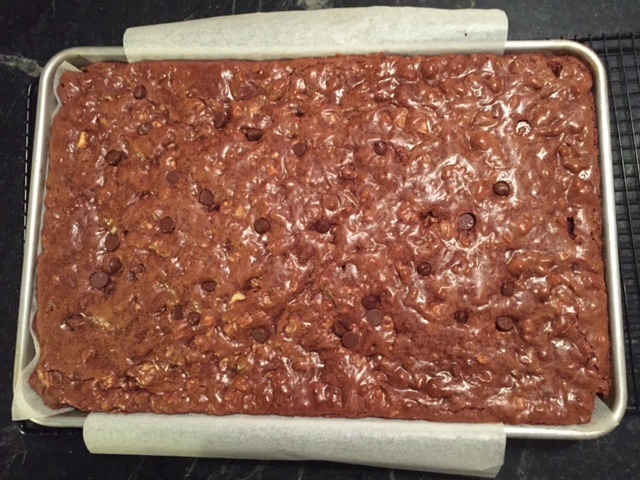 I typically triple the recipe and put them in a half-sheet pan (18 x 13 x 1 inch) because these brownies are meant to be given away. I actually ran out of walnuts, so this photo only has about half the amount. Usually they’re fully loaded—a nut-lover’s dream. Works too if you leave ’em out. Tip: The secret to fudgy brownies is to make sure you don’t overcook them. For easy clean up, line the baking pan with foil, leaving an overhang on two opposite sides. Butter the foil. When brownies are baked and cooled, lift out the foil along with the slab of brownies. Remove foil and cut brownies.